The Malpai Borderlands Group has protected 78,000 acres of private land through conservation easements. This protects natural wildlife habitat and productive ranch land by preventing subdivision and development. We work actively with ranchers and landowners to develop these conservation easements. In 2013 we took another step toward our goal to protect the Borderlands from subdivision and development. Long-termsuccess of our work requires that land protection goes hand-in-hand with habitat restoration and management to reducegrassland deterioration. Fire has played a natural role in maintaining the health of the native vegetation of the Malpai region for millenia. The best evidence for the history of fire comes from fire scars in the rings of ponderosa pine trees. Researchers at the University of Arizona Tree Ring Laboratory have collected fire history data from trees across the Southwest, from Sonora, Mexico, to southern Colorado, including mountains in the Malpai area. All of these trees tell the same story: fire burned across this country routinely every five to ten years, with only occasional spans greater than fifteen years with no fire. In fact, during a dry year following wet years, which can also be determined from tree rings, extensive fires burned in virtually every mountain range across the Southwest simultaneously. Evidence for the pervasive historic influence of fire is also found in the sediments of boggy cienega wetlands in the valley bottoms, where charcoal fragments preserved for thousands of years support the conclusion that fires burned frequently across the valleys from one mountain range to another. 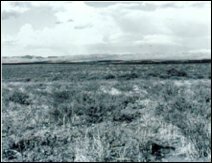 One of the important ecological roles of fire was to prevent woody species such as mesquite and juniper from spreading across the grasslands. Perennial grasses resprout vigorously following fire, keeping grassland productivity high, but fire kills most tree and shrub seedlings. It is common for deer, pronghorn antelope, and even bighorn sheep to move into recently burned areas to feed on the abundant new growth. The frequent occurrence of fire ended in the late 1800’s with the advent of large herds of livestock whose grazing reduced fine fuels. Roads and trails also broke up fuel continuity, and finally active fire suppression by government agencies in the 20th century attempted to put all fires out. As a result, we have seen a dramatic, and on-going, increase in woody plants that compete with grasses and eventually eliminate most perennial grass cover. This shift from grasses to woody species results in loss of vegetation productivity, erosion of soil, and loss of grassland-dependant animals, many of which are declining throughout the West. 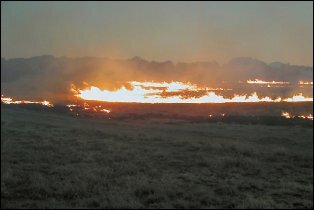 This trend toward loss of grassland can be reversed by returning fire to the landscape through careful application of prescribed fire. However, there is a threshold of grassland deterioration beyond which restoration is difficult or impossible, so immediate management action is needed to restore our grasslands while we still have tracts that are large enough to be ecologically sustainable. 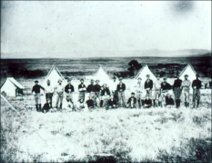 A Cavalry unit in the 1870’s camps near Astin Spring. Note the predominance of grasses. Managing fire in a big landscape the size of the Malpai region requires close collaboration between a variety of public and private partners. Since its beginning, the Malpai Borderlands Group has worked to encourage all the land management agencies to allow fire to play its natural role in the ecosystem whenever circumstances allow. The Coronado National Forest has proven to be a dependable partner in this endeavor, having conducted five different prescribed burns in the Peloncillo Mountains over the last twenty years. The Peloncillo Programmatic Plan facilitates prescribed burning and also the management of naturally ignited fire for the benefit of wildlife habitat, watershed function and forage production. The Guadalupe Wildfire is a good example of the latter. The prescribed fire known as the Thomas Tank Burn was ignited on June 18 and burning continued through June 20. As if on cue, rain fell on the burn site on June 21st. In all, 2,500 acres burned within a 4,300 acre perimeter. All of the involved land was Arizona State trust land and privately owned land on two area ranches. All ignitions were done from the ground. The fire crews worked in rough, brushy terrain in 100 degree weather. No accidents or injuries occurred during the operation. The Cottonwood Burn in the Peloncillo Mountains had actually been ignited south of the Geronimo Trail Road the previous summer and had impacted around 2000 acres before being shut down when nearby wildfires demanded the resources. This burn was originally planned for 6,000 acres on both sides of Geronimo Trail Road. This project was five years in the planning process due to the complexities in the development of a Peloncillo Programmatic Burn Plan to cover approximately 25% of MBG planning area. Baker Burn II had to be split off from the programmatic plan so it could be implemented. Much of what is learned from Baker Burn II will be reflected on the programmatic plan as it is completed. This 8,000 acre burn was ignited June 27, 1995. After over a year of waiting for the perfect time, the burn became a reality. The professionals on hand did a great job and MBG salutes them and expresses our thanks to everyone involved.